Pest: That's an alien bruv, believe it. 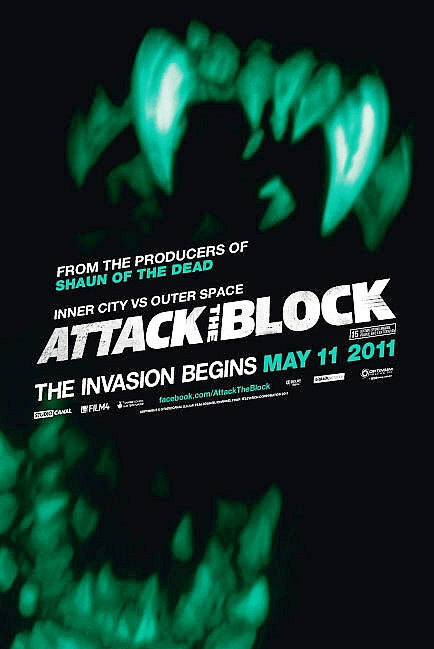 Attack the Block is wholly original and entertaining, believe! I have recently seen Super 8 and Paul, which serve as fun films that do a lot to pay as much tribute as possible to Spielbergian-era films of the 80s (mostly), but Attack the Block is a film that acknowledges what similar genre films of the past have done and creates its own fresh take on an alien invasion story. 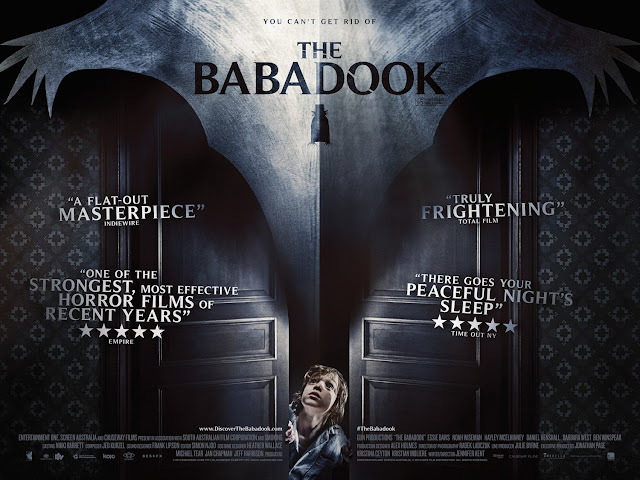 While shot on a low budget with many new and young actors, this film far exceeds similar, recent alien invasion films, due to its level of authenticity and confidence one can glean from the filmmaking portrayed here. 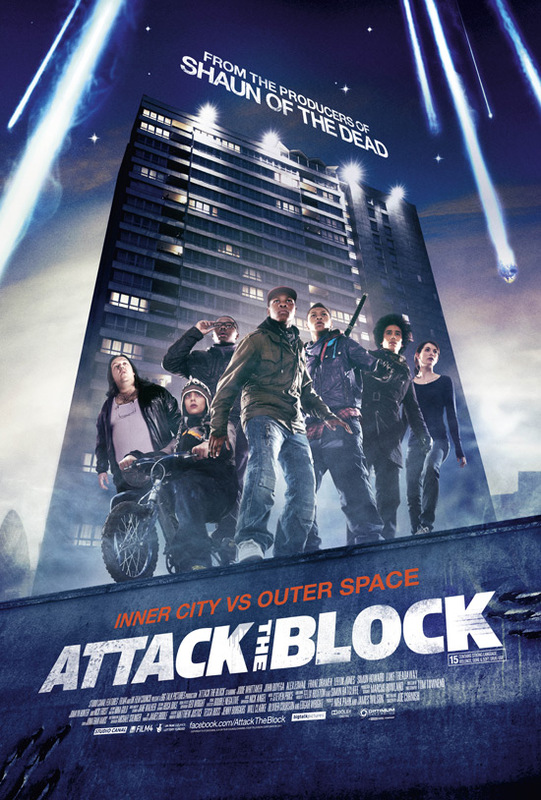 Coming from the producers of Shaun of the Dead and Hot Fuzz, Attack the Block is a wonderful blend of sci-fi, horror, action, and comedy that I could only wish to see break out as a mainstream success, but will easily become a cult classic. Cleverly stated by debut director Joe Cornish as, “La Haine meets Aliens,” Attack the Block, is an alien invasion story set in South London on Bonfire Night (American’s can sort of equate that to July 4th). 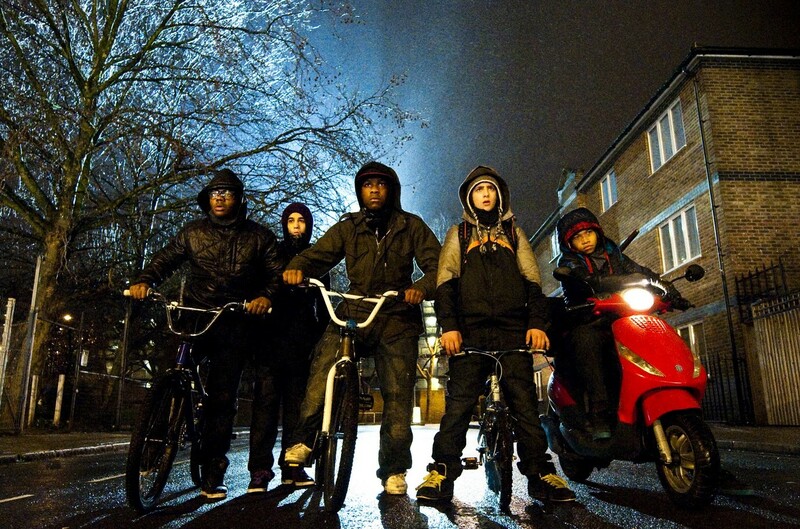 The film follows a young street gang, led by a boy named Moses (John Boyega). The other members include Pest (Alex Esmail), Dennis (Franz Drameh), Jerome (Leeon Jones), and Biggz (Simon Howard). As the film begins, the gang is in the midst of mugging a woman, Sam (Jodie Whitaker), when out of nowhere, something from the sky crashes into the roof of a nearby car. Moses investigates, is scratched by what appears to be some kind of animal, and takes it upon himself to kill the beast. Proud of his kill, Moses and the rest of the gang take the carcass of this foreign creature back to a knowledgeable friend of theirs. This friend is Ron, played by Nick Frost, who deduces the creature to be an alien and helps the gang to store the dead alien within his vault-like weed room. Of course, this only leads to more problems. The block soon comes under attack, when a much larger and more ferocious horde of aliens arrive from space, seemingly after Moses and his gang. The “block” in question refers to a multi story apartment complex, which houses primarily working class residents. This includes the parents, or whatever, of Moses and his gang, Ron (who lives in the penthouse on the top floor), and as it turns out, Sam, the women the gang mugged earlier in the night. 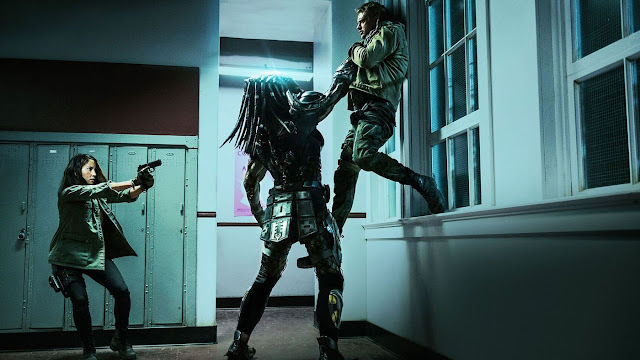 Among other things, the film essentially becomes a siege-type sci-fi/action movie, with the aliens terrorizing the block and those in the area, as the boys try to defend their turf using teamwork and a number of makeshift weapons. Shot on a low budget, from a first time director, with most of the lead actors making their film debut, recent films like Battle: LA and especially Skyline should take note on how to create a more engaging and entertaining experience, such as this one. 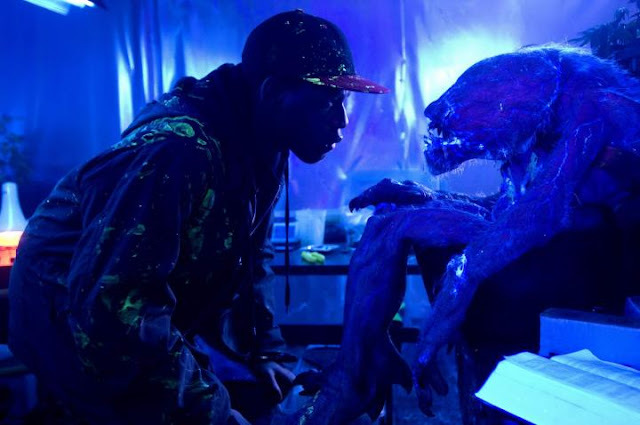 Attack the Block is full of imagination and wit. 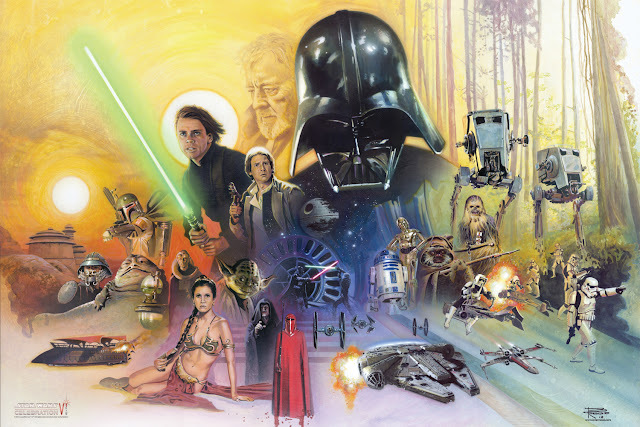 Any areas that fall into the traditional tropes of the genre only serve to benefit the film due to the authentic nature of the setting and characters, in addition to the amount of cleverness that this film has in dealing with its premise. As opposed to settling into clichés that only serve to make for cool looking action, this film is a wild mash of different genres, which only serve to tell a complete story. I have used the word “authentic” a few times, which is very appropriate, as the kids who play the members of the gang are literally kids brought in from the streets who have similar backgrounds in terms of their characters. This only serves to make the film feel, as I’ve stated, authentic, as the dialogue and slang talk is delivered more than convincingly and in proper accents (thick South London accents to be exact, which has led to the controversial idea of adding subtitles to the film). 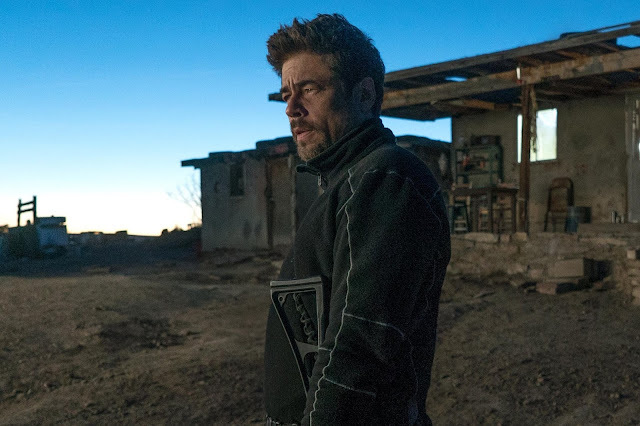 Additionally, the chemistry between all of the characters is great and the use of location feels like it’s been handled by someone who’s from the area (which is another true fact). 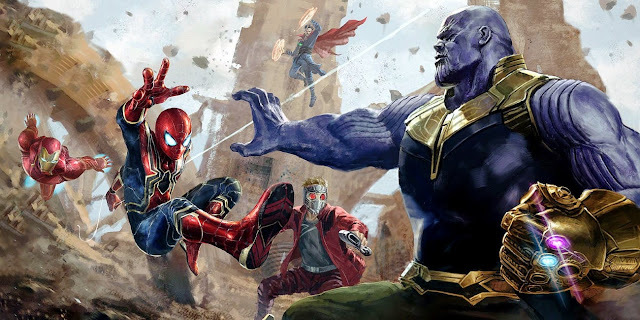 Despite mainly working in one location, the film is detailed enough to give that location an identity and establish its geography well enough to keep the audience involved with where these characters and the aliens are, as well as having fun dividing up the action. Another well handled and crucial aspect is how solid the creature design is. Without really delving deep into what these aliens look like, suffice it to say that they have a unique look that will go down as being much more memorable than other recent alien designs. I would probably credit that do to the simplicity of the creation, which combines the use of practical effects with some CG work added on. As the characters have more and more encounters with the aliens, it does become a lot of fun watching them deal with these creatures in different ways and seeing how the film manages to handle their placement in this story. As far as the tone and filmmaking style goes, while having Edgar Wright’s name amongst the list of producers, this film is not a specific play on other films in the same way that ‘Shaun’ or ’Fuzz’ is. 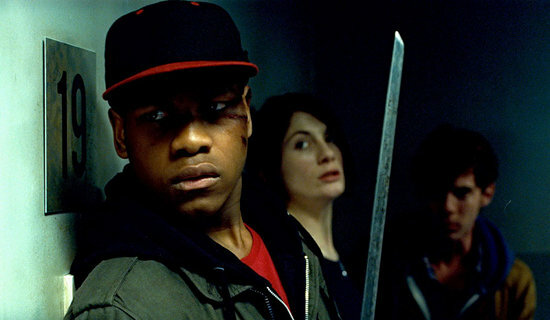 Attack the Block is very much its own beast, operating on its own level that merely has past films of a similar nature as its cinematic forefathers. Due to this, the film does have a lot of fun approaching, but not quite embracing a self aware edge. The film is quite funny, mainly through the chemistry between the boys, as well as the presence of Nick Frost, but it is a little gruesome as well and does not take the situation involving ferocious aliens lightly. Joe Cornish has done a wonderful job at putting this film together, managing to keep things moving at a brisk pace, while establishing characters, effective tension and action sequences, and even managed to get the electronica group Basement Jaxx to provide an awesome soundtrack for the film. 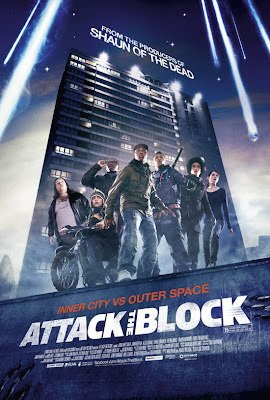 Attack the Block is a film that you go and seek out. Having now found US distribution (yay! ), the film is going to arrive in a limited amount of theaters, during an already packed summer. Regardless of the exciting mainstream fare that will be around, an awesome, original film such as this, that is as good as it is, only comes around so often, and should be sought out. Great work has been done by all involved to make a very entertaining film, especially as far as genre audiences are concerned. The flick has all the fun you’d want to see for a genre rollercoaster ride, trust. Jerome: I’ve only got one text left. This is too much madness to explain in one text! Great review. I just watched this movie last night. It is very original and very fun with just a touch of that Shaun of the Dead type humor especially from Pest.